Friday March 15, the Candidates Tournament for the World Championship 2013 will kick off in London. Oh, i wish i would be there to watch 8 top players ( Magnus Carlsen, Levon Aronian, Vladimir Kramnik, Teimour Radjabov, Boris Gelfand, Alexander Grischuk, Peter Svidler and Vassily Ivanchuk) battle against each ether to decide the sole challenger to fight for the World crown against the current World Champ- Viswanathan Anand. 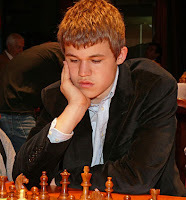 I will root for Magnus Carlsen for the simple reason that he is the current world top player and his current elo - 2872 is the highest in history. It would be an interesting World Championship final this October if Carlsen emerged as the challenger against Anand! 8 Non-Asians fighting for the right to "assassinate" the only Asian champion. Should also have reps from the 3As Asia, Africa & Americas to make it interesting.